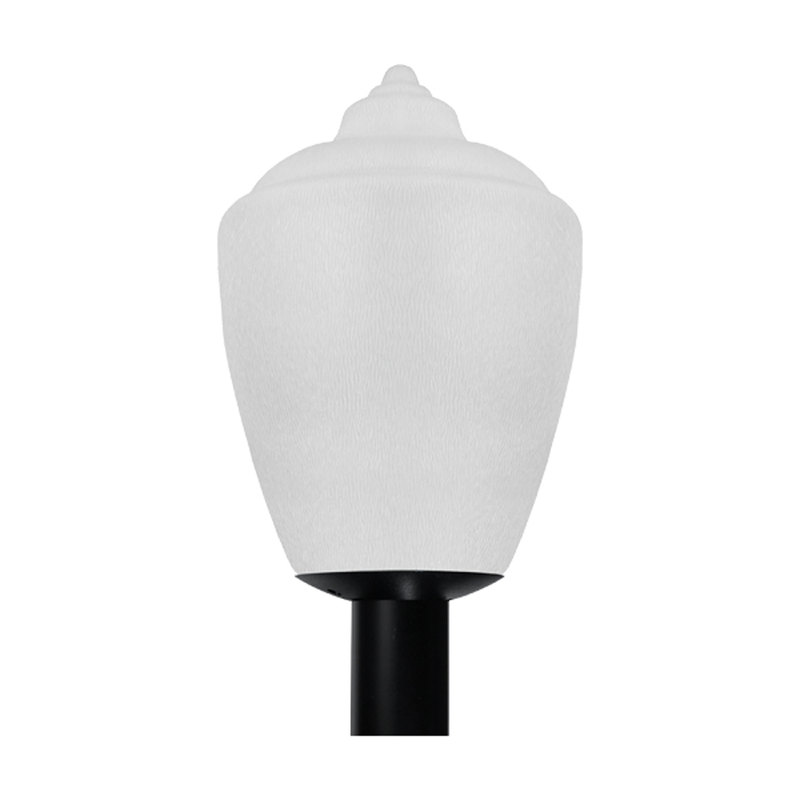 Ornamental post top light with textured polycarbonate acorn globe has a classic turn-of-the-century look for many commercial area lighting application. 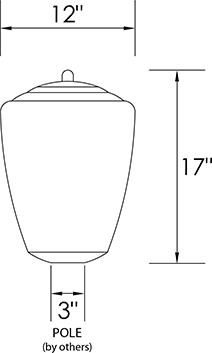 Subject to the terms, conditions and all other details specified in this limited warranty, Brownlee Lighting warrants that all lighting products manufactured by Brownlee Lighting are free from defective materials and workmanship - and that under proper installation and operation at recommended operating conditions at rated voltage, they will be free from failure of lamp holders, starters, ballasts or other component part for the warranty period. Brownlee Lighting LED products: Five (5) years from the date of invoice (see LED Notes 1 & 2 below). Brownlee Lighting ENERGY STAR® qualified fluorescent products: Three (3) years from the date of invoice. Lamps (CFL, linear fluorescent, HID, GU24-based LED, etc.) are not covered under this warranty or by Brownlee Lighting in any way. Lamp failure is excluded from the terms of this warranty - claims should be addressed directly with the lamp manufacturer. The warranty on custom products can vary and is determined on a case by case basis - consult with factory for details on custom products prior to purchase. 1)	Exception: Models 7080, 7317, 7318, 7319 & 7322 with LED products: Three (3) years from the date of invoice (see Note 2 below). 2)	LED boards are considered to have failed when 13% or more LED chips are not illuminated. Damage incurred in transit, loading/unloading or from handling and/or installation is excluded from the terms of this warranty. Brownlee Lighting is not responsible for any failure or damage resulting from: product(s) being altered or modified, improperly installed, installed in applications for which not intended and/or recommended, abused or damaged by fire, vandalism, natural catastrophe, acts of God, or any other act(s) of the purchasing party and/or subsequent parties. Proof of purchase is strictly required. Brownlee Lighting reserves the right to examine the reported defective or otherwise claimed product (and/or other supporting evidence satisfactory to Brownlee Lighting) in order to establish a claim under this warranty. Brownlee Lighting may require the return of any product claimed not to be as warranted to its headquarters, transportation prepaid by purchaser, to establish a claim under this warranty. The cost of labor for removing a Brownlee Lighting product and for installing a repaired or replacement product shall be borne by purchaser. 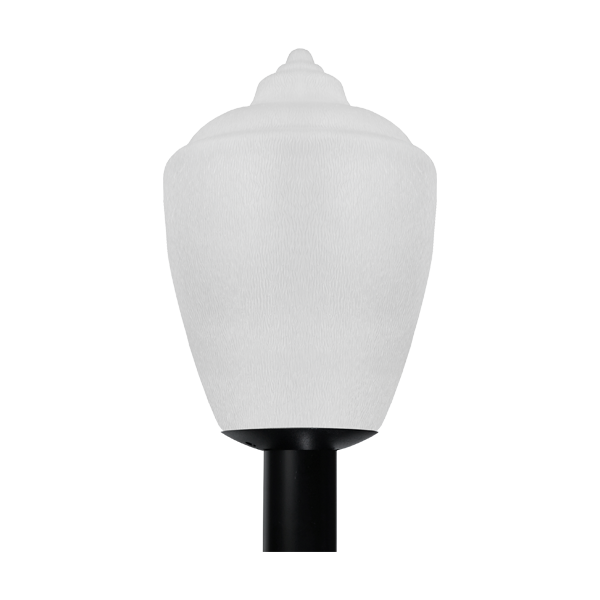 Brownlee Lighting covers only the repair or replacement of the defective part(s) covered under this warranty, to the original purchaser, and excludes any responsibility for consequential or incidental damages such as labor costs, travel time, freight expense, loss of profit, loss of time, etc., incurred by the purchaser and/or any other party. Replacement parts/fixtures provided under the terms of this warranty are warranted for the remainder of the original warranty which began at the original date of invoice.